it costs me $10 a week to commute back and forth to boston on the subway. it only costs me $3 to fill up the tank of my motorcycle, where i can ride for 120 miles without refueling. i've made a decision, so long as the weather's nice, i'm going to bike into boston. so today i kept my eyes open for potential parking spots, i have a few in mind for when i ride into the city tomorrow morning. i went to rod thai for lunch today, located on that 2nd floor chinatown food court, above the fung wah bus ticket counter. i got a takeout of pad kra pao ($5.50), a hot thai basil rice dish mixed with minced pork. there was a cockroach crawling on the wall. the last time i was there with mandy (where we got our bubble ice tea) she swore she saw a mouse running across the floor. speaking of which, the floors were so dirty i didn't dare look down. there's also a public bathroom somewhere in this seedy establishment, but you couldn't pay me enough money to go check it out. 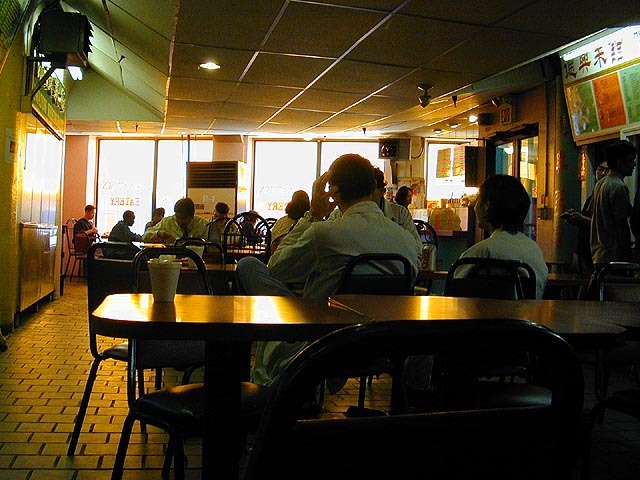 the place was supposedly safe though because i saw a doctor order his food from them, three doctors as a matter of fact, each in their white lab coat with their pastel scrubs underneath, all that was missing to complete the look was a stethoscope and a surgical mask. the noon day sun cooked the bags of trash lining the streets, chinatown becoming more fragrant than usual, including the stench of the chicken slaughterhouse right below the food court. the pad kra pao was good, but somehow i lost my appetite. i also went running today at 3pm. alex was at an offsite meeting, and kristine could go either even though she recognized today to be a perfect running day. so i went by myself, up to the charles river, over the mass ave bridge, across the longfellow. last week must've been a fluke because i couldn't do the whole course non-stop. i must not have been running very fast last time, or maybe today i was going too fast all by myself. i run to exhaustion, when either the pain from the cramps inside my body forces me to stop or the overheating. i haven't suffered from cramps in a while, i think it's mostly a problem that happens when you first start running, after a while your body adjusts, maybe your internal organs don't jiggle as much. the few times i stopped to a walk, i was just exhausted, a wheezing panting, so tired i could only open my eyes to slits. i went to bed last night at 5am, so i only slept for 4 hours. by the end of work day, i started to get pretty sleepy, and was trying hard to stay awake. being that i'm on a freelancing schedule, i could've left early if i wanted to, but i didn't want to get stuck in rush hour traffic so i stuck around until 6pm. made no difference, the subway was still crowded, although i did get a seat, and spent the next 7 stops on the red line scribbling in my journal. i had some plans this evening, but nothing came of them. mandy was supposed to drop by, but two of her nyc friends were in town, so she had to be a good hostess during their visit. dan was having a football party at his place, but i was in no mood for football after yesterday's day of infamy. alex dropped by to retrieve a flash mx cd for the pc and made me show him some flash basics, even though i couldn't remember a lot of my flash. 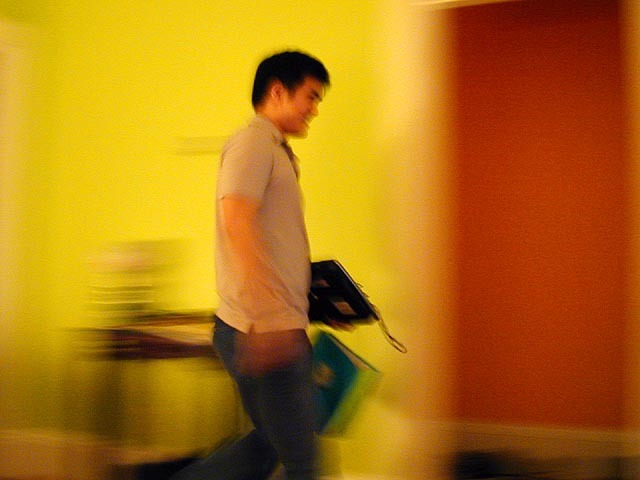 my elusive roommate mike made a cameo appearance, grabbed his laptop from his room then disappeared out the door again. i also gave alex some design tips, reminding him that simpler is often times better. after alex left at 9pm, i finally cooked up the drumsticks i had marinating in the fridge. after about an hour of oven baking, they were ready. verdict? disappointingly mediocre. what it needed was the flame cooking of a barbecue, oven cooking leaves the chicken too juicy and tender, which isn't what i like. adam gave me a copy of no one lives forever, i'll be playing that for the rest of the evening, then going to bed early.